Bringing Home A Puppy ? Don't Forget To Do These Temperament Tests Before Doing So. Bringing home a puppy is a big deal. You are about to bring someone in your family, so it’s probably a good idea to do some research beforehand, right ? And it is more than just choosing the right breed for you and your family. You must remember that even dogs of the same breed are born unique and have different traits and temperaments that they inherit from their parents and form out of their external stimuli. So naturally, it is good idea to do a quick test to check the pup’s temper and attitude before you decide to adopt them. Here are the 10 tests to tell you whether you are about to bring home a happy-go-lucky, intelligent companion or a aggressive and potentially dangerous hound. In this test, the sociability of the dog is tested to see whether he seeks human contact or not. 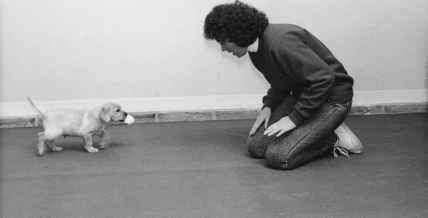 The owner need to distance himself/herself 3 feet from the dog and after kneeling down begins encourage the puppy to come closer to him/her. Hand gestures or vocal directions can be used.